I've never tried these before, but I have to say I love them and now I'm going to seek them out in a local shop as they were that good! They are so full of flavour, it's mindblowing! 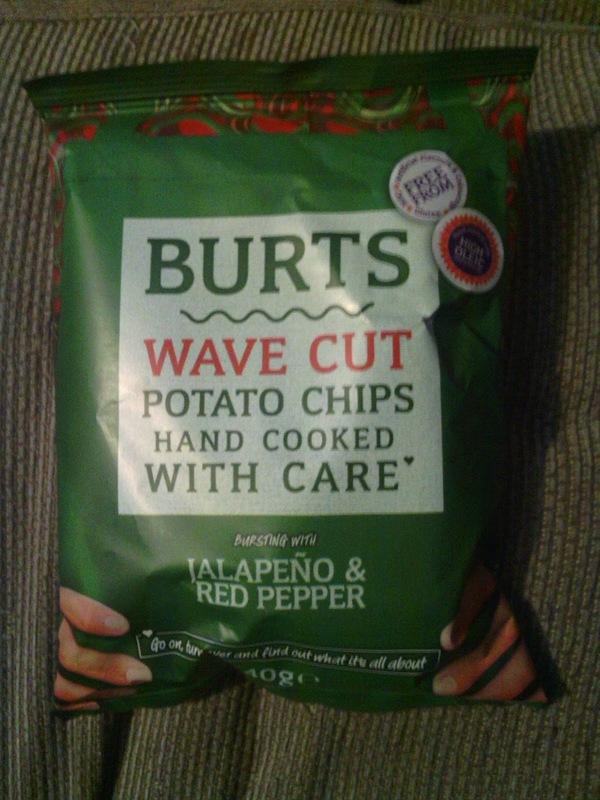 Lots of crisps are lacking in flavour or only get more flavoursome towards the bottom of the pack, but these were soaked in flavour top to bottom and that's just the type of crisps I like. Not to mention then fact that I am a huge fan of all things spicy and so the jalapeno and red pepper flavour is a great choice for me. In terms of crispy, they were just right too. 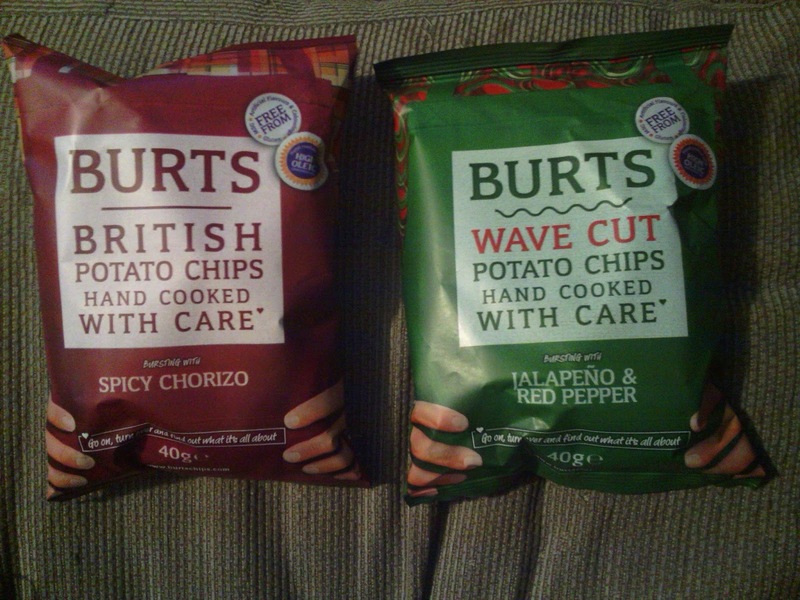 As ironic as it might sound, I'm not a fan of crisps that are too crispy. I shared the packet with my husband, Paul. This is what he thought of them: "They were nice and flavoursome and spicy. The bag seemed bigger than an average bag of crisps and more is better!" "Whet your appetite and tickle your taste buds with Red Pepper & Jalapeno, the fiery, mouth-watering crisp inspired by traditional Mexican flavours. Perfect eaten straight from the packet or even better dipped in a cool salsa, hummous or tzatziki, these crisps are the perfect party snack or nibble for a summer BBQ, as they really pack some punch! Pair with a rum based cocktail such as a mojito or caipirinha, to get your party into full swing"
I have never had chorizo before, so I honestly cannot comment on how realistic the flavour is, but again they are extremely flavoursome. I didn't like the flavour so much of this packet though. Maybe I just don't like chorizo? The crisps are very fresh and well, crispy (as they should be). I am very impressed overall by the new spicy flavours and I for one, hope there will be many more spicy flavours added in the future. 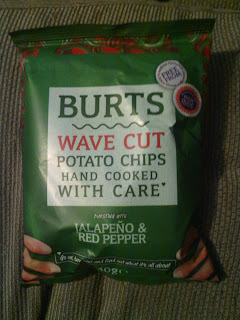 I'm officially a Burts convert now! I shared this packet with my son, David, aged 10 and he said: "They are really nice and I liked the flavour lots. They had just the right amount of flavouring." "Say hola! to Spicy Chorizo. The traditional rich Spanish sausage has been combined with fresh fiery chillies and fragrant paprika to give your pallet a serious kick. The perfect pre dinner party snack, these tasty potato chips are sure to prove popular with guests. Try incorporating into a tapas night with friends, pairing with a glass of full bodied red wine or a jug of cool, fruity sangria." Burts Chips are available in 40g (RRP 69p) and 150g (RRP £1.89) bags from delicatessens, farm shops, independents, pubs and bars nationwide. *Guinness Burts Chips are available from Selfridges, Waitrose, Tesco and Morrisons, priced 75p for a 40g packet and £1.99 for a 150g packet. I found these crisps to be very oily. 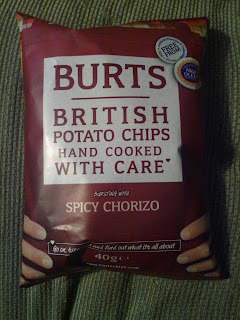 Not a patch on Tyrells or Kettle crisps.